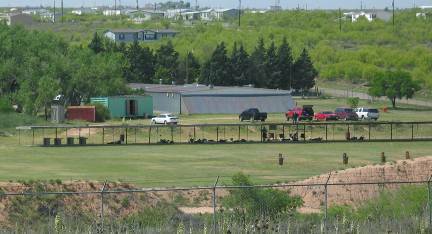 The Amarillo Rifle and Pistol Club (ARPC) is a National Rifle Association (NRA), Texas State Rifle Association (TSRA), and Civilian Marksmanship Program (CMP) affiliated private-membership organization located on 40 acres of Club-owned land on North Western Street, 2 miles north of Loop 335. Facilities include two outdoor rifle ranges, three outdoor pistol ranges, and a building housing a classroom/meeting room and indoor range for smallbore rifle and bullseye pistol competition. The ARPC was formed in 1936 and operated in the basement of an unfinished hotel located at 7th and Tyler in downtown Amarillo. In 1951 Amarillo attorney G.R. Whittington reorganized the Club to use expanded outdoor facilities at the present location. Mr. Whittington owned the land and rented it all to the Club for $1.00 per year; however that rent was never collected or accepted by him. The Club purchased the land and facilities from Mr. Whittington’s estate in 1986. Mr. Whittington was well known among shooters during his lifetime. In addition to his Club leadership he was a nationally-ranked NRA Smallbore competitor and his name was included in the title of the NRA’s Whittington National Shooting Complex at Raton, New Mexico to honor his work in creating that property. Our Club has an impressive 80 year operating history. We have trained hundreds of young people to shoot and have provided years of educational and competitive shooting and sporting programs for the people of Amarillo. We take great pride in our long record of safety and community service while providing a safe place to compete, to shoot, and to instruct generations of shooters in the safe, accurate, ethical, and legal use of firearms. All of the Club Programs/Events are open to the public: you need not be a Club member to compete or participate. However, unsupervised use of the Club's outdoor ranges is restricted to Club members and their accompanied guests. The Indoor Range is used only for supervised, scheduled activities and is not available for unsupervised use by anyone. The Amarillo Rifle & Pistol Club welcomes new members. Any person 21 years of age or older who may legally own a firearm and is a member of the National Rifle Association is eligible for consideration. Those desiring to join the Club should download the application form and complete it . Two current members of the Club must sponsor the applicant. By signing an application the sponsors vouch for the applicant’s personal integrity, common sense, knowledge of firearms, respect for safety, willingness to follow the Club rules and affirm that the applicant has visited the Club and shot on the ranges as a guest or as a competitor. If no members are known to the applicant, they are urged to participate in any of the Club Programs/Events (matches) and demonstrate the necessary attributes over time. Applicants should not approach members strictly for sponsorship or signatures. The Club has a membership cap of 375 members. The monthly newsletter lists the number of openings available and the number of applications on the waiting list. Applications are filed, and called, in the order received. All pending applications are held on file by the Club Secretary for two years. To be inducted into the Club, the applicant must submit a signed, sponsored application and have been notified that the application was received and is in order. When the Club has membership openings the applicant must then attend a regular meeting of the Club membership accompanied by at least one of their sponsors. Regular meetings are held on the second Tuesday of even-numbered months except December. The sponsor will introduce the applicant to the members and speak on his/her behalf. After any questions, members attending the meeting vote on the applicants’ application. Once inducted, the new member must attend an on-site three-hour orientation program before they are given access to the Club and allowed shoot on the outdoor ranges without supervision. There is a one-time initial membership assessment of $50. All memberships run from June 1 through May 31 of the following calendar year: there are no Life memberships. Annual membership dues are $100 for Senior members (those 65 and older) and $125 for Regular members. Members not participating in one of the three or four Work Days each year are assessed an extra $10 fee. Members joining the Club after the beginning of the membership year are charged a prorated annual membership fee in addition to the $50 initial assessment. If you have additional questions, please contact the Club Secretary.